THE DABELS DIVULGE (RESURGENCE): say, er....what? Once again the two wee's are at day camp. One happily and one not so happily. Why does the 9 year old think he's 14 and therefore too old for the 'little kids' at day camp? I am supposed to be doing homework but instead I am not doing homework. I want to talk about the word 'er' for a moment. Indulge me, would ya? 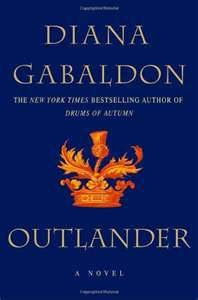 I am reading Outlander. I bought this book about three years ago and have put it off because it's long. And it's also part of a series which scares the crap out of me. I like to remain non-committal when it comes to most things. I have committed to an eternal marriage and to at least 4 eternal children. That's a ton of commitment, is it not? I would like, therefore, to have relationships that are a lot less committal because of all the previously mentioned commitment. Okay, here's an observation that has plagued me the entire time to took to write that last paragraph: Commit has one t. Committal has 2 t's. Committed had 2 t's but commitment only has one t.
Anyway, books are a pretty safe place to remain non-committal. No one gets hurt when I decide to not finish a book. Well, I get hurt because once I start something I like to see it through. Until I think too much about commitment and then I decide that books are not something I need to be committed to. Are you confused yet? Good, welcome to my blog. Okay, so, Outlander has about 850 pages in it. To me that's a big book. I don't like such big books because of.......you guessed it, my commitment, or lack thereof, issues. But I bought the first of the series because I heard good things and I did love the Harry Potter series (except for the last half of the last book which I still have yet to finish. Another story.) But clearly, I don't mind a good series. How do you know if it's good, though, if you don't read the books? And 7 or more 800 page books?? That is starting to look like an eternal commitment to me. This is totally not what I wanted to talk about today. What is going on around here? Er. Er is what I wanted to talk about. Do me a favour and read this next sentence out loud: "You were, er, ah...I mean...do ye not remember me, from then?" And this one, remember, out loud: "Oh, er, aye." And this: "I, er, don't suppose he means to take any steps about it?" Now, in all honesty, have you ever in your life heard anyone use the word 'er' in a conversation? With you? In real life? Um? Yeah. Too much um. Uh? Naturally, most of us use that one. And not intelligently, I might add. But er? Is that an English, like from England, thing? I don't like it. And it is way over used in this book. I want to propose that we do away with the word 'er' in the English language as it seems nonsensical to me and completely unnecessary. Are we all agreed? Good. I will admit that I almost broke up with this book at page 100. That was the level of my commitment. 100 pages. I decided that since I read that 100 pages real quick-like I would commit to another 100. I am on page 200 and I, er, will admit that I, er, really like it. So I will, er, commit to the end. Of this book. Not the series, necessarily. Geez, what do you want from me? I have also had this book for three years. All of the them in the series. And have yet to start it. Wanna try together? Nevermind. I have already changed my mind. I've read half of the book because soooooo many people adore it. I can't get through it. Something must be wrong with me. I hate books everybody loves. Boo. Er is totally an English word, my Dad and Grandmother use it all the time. I think that is why I do not notice it anymore. Glad you pushed through. I was tempted to grab mine and flip to page 100 to see where you were ready to give up. As for the series, I own it all and I cant seem to get past book 5. It is a serious time commitment. Everytime I want to read it again, I start over and get stuck at book 5 every time! I am not much of a reader because I get too wrapped up in them. Not sure about er. Um is the standard fill-in here. Your posts are always entertaining!